When you think of the very first car created, what do you imagine? Cars made out of tree branches with stone wheels, powered by Fred Flintstone’s feet? A quaint little buggy with thin, oversized tires, driven by a man wearing a top hat? What did the very first cars look like, and how have they changed over the years? They’re probably a little different than you’d think! While some of the very first cars were powered by steam engines, dating back to the 1700’s, it was Karl Benz in 1885 who invented the first gas-powered car, which he later received a patent for in 1886. Benz’s first car had three wheels, looked much like an elongated tricycle, and sat two people. Four-wheeled gas-powered cars were later introduced in 1891. The invention of the gas-powered automobile marked the beginning of the evolution. The first cars didn’t have windshields, doors, turn signals, or even a round steering wheel – a far cry from what we’ve become accustomed to. It can be said that Karl Benz’s first gas-powered car was the major catalyst for the production of automobiles, as many followed in his footsteps, trying to create their own version of a car. 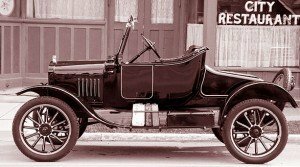 It wasn’t until Henry Ford’s 1906 Model T that automobiles started to resemble what we’re familiar with today. Thanks to Ford’s invention of the assembly line, cars we able to be mass-produced, and became affordable to the general population. And, along with mass production came new features, some of the first being speedometers, seatbelts, windshields, and rear-view mirrors. Believe it or not, the first turn signals weren’t added to a car until Buick did it in 1939 – that’s even after the first car with electric windows and air conditioning! Then cars started to get fancy, with power steering (1951), cruise control (1957), three-point seatbelts (1959), and heated seats (1966). In 1973, Oldsmobile installed the first passenger airbag into their “Tornado” model. Over 20 years later in 1998, the federal government required all passenger vehicles to come standard with dual frontal airbags. In the late 80’s and early 90’s, keyless entry systems, electric doors and windows, sunroofs, and CD players began to gain popularity. Which brings us to modern-day cars, with MP3 players, hard drives, advanced safety systems, GPS, and even the ability to parallel park themselves. Seems crazy, but it’s true. In this age, cars come standard with features that were once a luxury (or didn’t even exist at all). It’s amazing to think how far cars have come…and the technology keeps advancing.